Mouse anti Human Ku70 antibody, clone 4C2-1A6 recognizes human X-ray repair cross-complementing protein 6 (XRCC6), also known as Ku70, Lupus Ku autoantigen protein p70, CTC box-binding factor 75 kDa subunit or ATP-dependent DNA helicase 2 subunit 1. Ku70 is a 609 amino acid ~70 kDa ATP dependent helicase involved in chromosome translocation (UniProt: P12956). 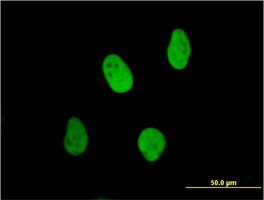 Recombinant protein corresponding to aa 1 - 610 of human Ku70 conjugated to glutathione S-transferase (GST). 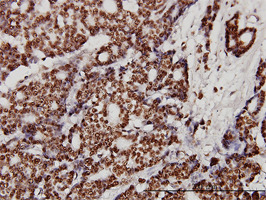 Mouse anti Human Ku70 antibody, clone 4C2-1A6 detects a band of ~70 kDa in western blotting using lysates from either C32 cell lines or XRCC6-transfected 293T cell lines. Slupianek, A. et al. (2011) BCR/ABL Stimulates WRN to Promote Survival and Genomic Instability.